Upon opening my mailbox one morning, I noticed a lot of leaves and pine straw and thought it had been blown in from a bad storm the night before. I removed it and low and behold, more appeared the next day. I realized that this was not debris from the wind so I left it in the mailbox. The next morning there was a cute Carolina Wren with a mouthful of leaves, etc. waiting on the deck rail and inside the mailbox was another who was already arranging the furniture! I quickly decided that I had to take immediate precautions to protect the nesting event, and that would be to prevent mail from being put in the box. I made signs on the computer to alert the postman and also put up a temporary "alternate" mailbox on the other side of the door and marked it "mailbox" So far, with a few exceptions, the mail personnel have been compliant. I have not seen any eggs yet, but I am hoping that this will take place. 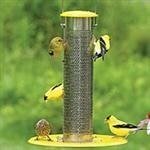 I have a feeder not far from this area which is always very active with various species of birds and many Carolina Wrens, as well. Have never seen them before this Spring. It is interesting that this wren likes to sweep out the seeds at the feeder more than eat them there, and then they and all their friends have a party on the ground to eat them. 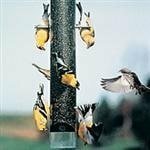 The negative side is that it empties the feeder much too quickly, so I think I will put up a sign for them to be more conservative!!! Years ago I hung my husbands jeans on the clothes line. When I went out that evening to gather the jeans, a wren had built a nest in the back pocket. I left them on the line. Over several days, I kept hearing a "clink" sound 3 or 4 times a day, that was coming from the attached mailbox on my front porch. At first I thought it was the mail delivery, since when I got around to going outside the mail would have been delivered. When I stopped one day at the repeated sound to really THINK, I realized our mailman is usually chatting on the phone when he comes by and the intermittent series of tiny "clink" sounds I'd been hearing had been isolated sounds with no background noise. 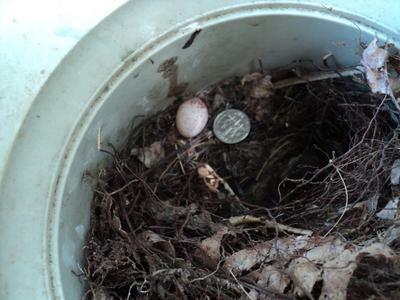 I looked in and realized there was now a tiny speckled salmon-colored egg in what was really a bird's nest in the box. It's June now, --seems like that's late for nesting! But I duly put up a note telling the mailman to please drop my mail in the flower pot underneath the box--and I'm sure he will...lol. I did notice there were a few ants crawling over the egg...is that a bad sign? The egg is new I THINK...like I said, I didn't see it yesterday when I looked in...but I might have missed it. It's not cracked that I can see. I'm hoping for a late June birth :). That's really CUTE!! Enjoy watching the family grow!! I bet the delivery servicemen are quite willing to set your mail somewhere else nearby. Here in the High Desert in So. Calif. I have the Cactus Wrens, the Rock wrens, and the Canyon wrens! Thanks for guarding their home! cant wait to see pics of the eggs and babies! 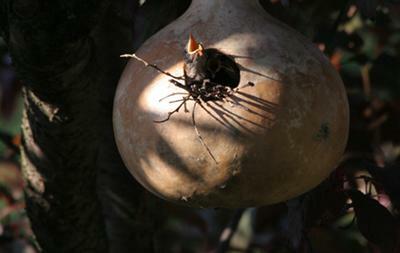 A relative was going to grow and finish gourd birdhouses and sell them on Ebay. We ended up with a complimentary prototype. I figured it was just a tree decoration, but as it turned out it was quite functional. I think the male must have taken 2 weeks or longer to attract a mate. Day after day, hour after hour, morning-till-night, the same song over and over with no letup, until the magic day when they met. 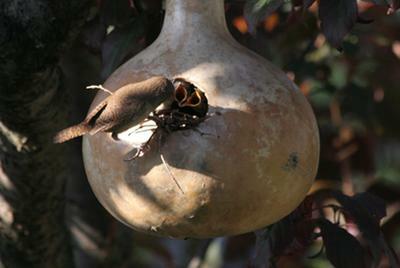 I don't know about other nests the male constructed, but the female picked the gourd. Since the eggs hatched (3 of them) and the task of feeding the chicks began, the adults have become silent. 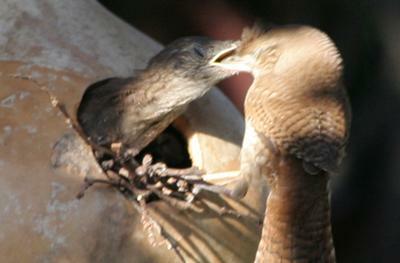 One of the parents is the nest cleaner, and that's real love, seeing as all they have to clean with is their beaks. Nuf said about that. I hope to witness and photograph the young's first flight. I have a hanging basket on my back deck which hangs off of the frame of a canopy which covers it. The hanging basket has a hosta in it. 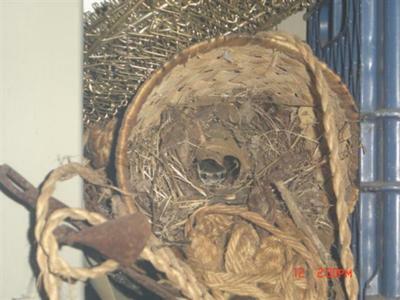 A pair of wrens are occupying the Nest in the hanging basket into which the female laid four eggs about three weeks ago. 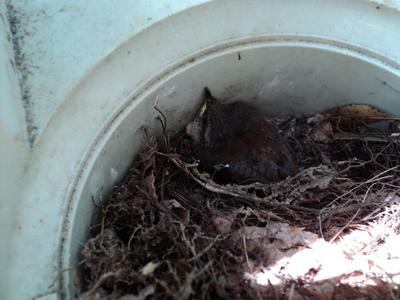 A couple of days ago two of the eggs hatched and there are a couple of baby wrens occupying the nest. . I really like the idea and creativity behind it! 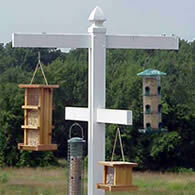 It's really amazing how you can get a bird famly to live in your backyard. I love your post and creativity! 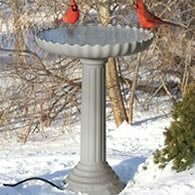 It is such an amazing idea to have birds in your backyard, just build a nest for them and soon have the bird family in your neighborhood!!! I just noticed this nest this morning. It was constructed very quickly as I watered the Christmas cacti last Friday before leaving for the weekend and there was no sign of it. 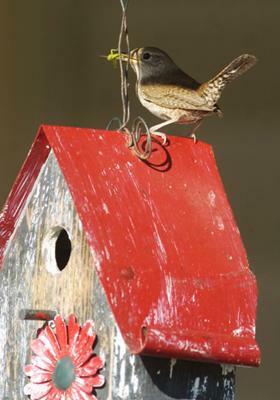 I heard the male wren singing while perched on a wind chime support on the porch this morning. I tilted the blinds slightly to get a better look at him and noticed the nest. The female flew from it just a bit after that. I went out and examined it taking the pics at that time. There are no eggs yet but I'm hopeful to see some soon! 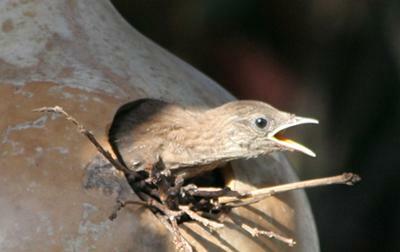 I'm reminded of a wren building a nest in a potted plant on our porch in Texas many years ago when my girls were small. It was exciting for all of us to observe the progress of the nestlings including fledging. 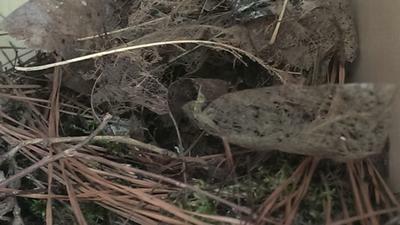 Your picture helped me to identify a wren nest on our deck. 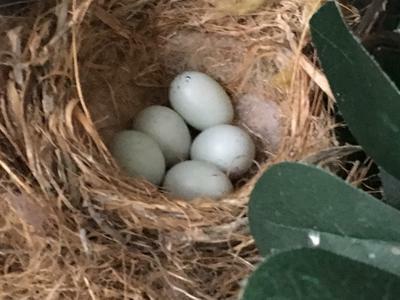 The nest is in a potted plant about waist high and is identical to your pic, except the mom covered up the hole this morning. Guess she didn't like me coming out to look at it. So fun and exciting! One of our wrens delivers a grasshopper for the little one's breakfast. 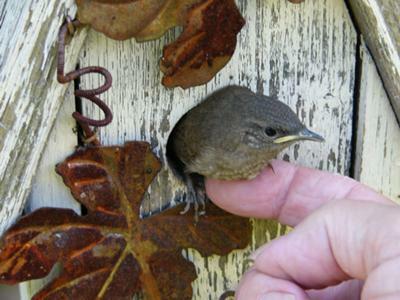 When our house wrens come to start their nest, it is a very enjoyable time, but not a quite time. It is never hard to tell when they are in the area as their song is sung loud and often starting very early in the morning. We've never hard a hard time attracting the house wrens. A simple small house hung on the clothes line brought our first two pairs in several years ago. After moving, we hung two houses under the porch of a storage building during the winter as spring rolled around, in come the birds. 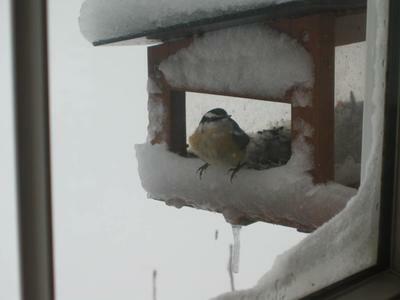 Our birds have never seemed to mind us being around their boxes until this year. Before they would sing and let us know if we were close, but this year they become really defensive. Part of it may the young cats that have become permanent residents at our house. The cats can't get to the birds or the boxes, but we know the wrens have a fit when the cat gets near. One particular bird become very defensive after the eggs hatched. While watering the flowers one morning near the boxes, one bird followed me and tried to grab my shirt sleeve as I walked away. We love it when they are around. We have several other types of birds around our house, but nothing else seems to enjoy singing loud and constant as the wrens. We hoping they keep coming back. I have one of the houses you mount to the window so you can see the birds inside. It was there all summer but no birds came. The year before, the wrens built the nest behind the Cactus plants I had in this window so I put the house on the outside window just above where they had built their nest, hoping they would go in the house. I put a leaf inside the opening to help entice them but that didn't get results either. 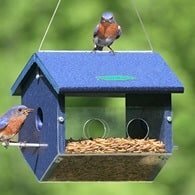 Does anyone have any episodes on how they get the birds to " find" and use this see thru bird house? Thanks for the help. I enjoyed your story & know what you are talking about, as we have wrens at our home, also. They are quite protective, but have never had them grab at us. We do not have any cats on our property & like it that way. I hope you continue to enjoy your "little but loud" wrens for many years to come. Thank you for sharing your story - makes me smile. Wrens are just the little entertainers aren't they - what characters. Enjoy your friends. 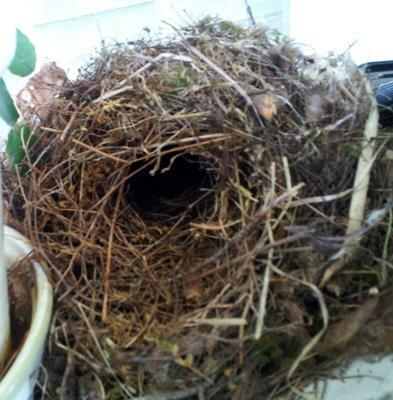 Two years ago a wren made a nest on our porch in a wreath. We named him Little Buddy and became intrigued. We kept peeking in the wreath to watch the progress which I thought was probably bothersome to the little family. So, we taped a webcam to the wreath and ran the video to our computer. We found out we could stream the video and we did...we had a following of kindergartners, libraries, preschools and normal people like you and me. It was riveting. We watched the momma nest, then saw the eggs, little hatch-lings and then they were gone. These parents work hard to feed those babies! Well, this year I have a cabinet on the porch and a wren is back. We call this one Junior. Again we've set up the stream and have over 47 views already (in one day). So far it seems the nest is built and a a bird is sleeping in it at night....anticipating some nesting soon. 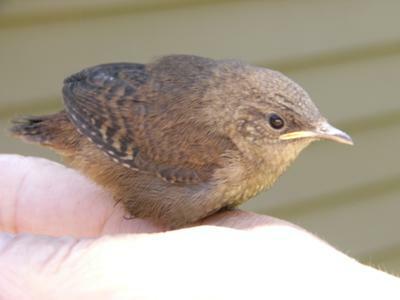 We have a family of wrens that are around all winter on Long Island. If we do not close the garage door early enough at night, as many as three wrens will be in the garage at daylight looking to get out. Even though we see no sign of them when we close the garage door. When they do get shut out of the garage, they will roost for the night in the wreath that hangs on the front door. This surprises any after dark visitors during the Christmas season as the wrens flee the wreath as company approaches. My guess is they are looking for warmth through the night. 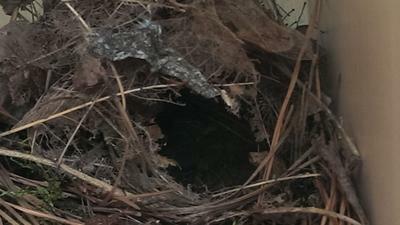 If you look in the "hole" in the middle of this nest, you can see the momma Carolina Wren sitting on her eggs. She and her mate built their nest in a hanging planter basket that was turned sideways on a shelf in our garage. My husband adjusted the garage door so that it wouldn't close completely and shut them in or shut them out. They carried in leaves, twigs, and bark over a period of several days, but then we didn't see them and thought maybe they had decided to nest elsewhere. But soon we saw a tiny egg in the nest followed by another a day or so later. After she finished laying she began sitting on the eggs day and night. I'm not sure where her mate is staying, but he keeps a close eye on her. Anytime we go into the garage he flies out from wherever he is and perches up high to watch us and make sure we don't bother her. Thank goodness he doesn't "dive bomb" us like I have seen mockingbirds do. He just watches us until we go inside. She began sitting on the eggs on June 12, 2010, so we should have baby birds around June 26. Just adorable. Thanks for sharing, it made my day. I have had this box which was more of a decoration than a nesting box for about 5 years. This is the first year a wren made a nest in it. I watched it closely, took lots of photo's and was fortunate to see the first baby fly off. The photo's are of the second or third one that just couldn't make it out of the box. It got stuck and crawled back in the box and chirped for about an hour or so at the hole. I talked softly to it and approached it carefully and reached out to touch it and it let me stroke it's neck. It jumped out on my hand and quickly pooped in my hand (LOL), it stayed for a few seconds and then launched from my hand. The mother and father are now setting up again in the same box with another brood. The mother stays at the hole for a few minutes and I talk to her before she fly's off to the nearby apple tree. After the first babies flew off the father was singing his head off for hours during the morning and most of the day and I think he was singing for his mate to come check out the box again. They are the sweetest little birds that I have ever seen. 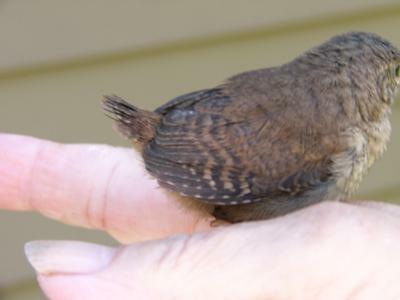 Such an endearing photo of the baby wren being helped by a human hand!! Nice job. thank you for your comments. It appears that now the mommy is sitting on another set of eggs as she lets me get a little close and I talk to her a little before she flys off. I put out dried meal worms but not sure the Wrens eat this. The first batch I put out are now gone. Such a precious picture and such a wonderful story. 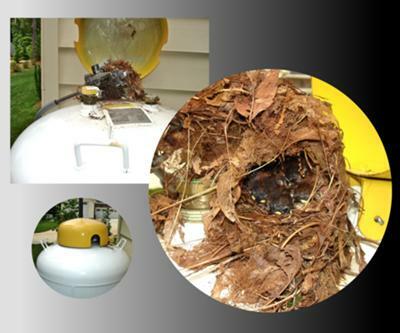 It is the beginning of summer in North Carolina and we noticed birds building nest in several trees around our home. 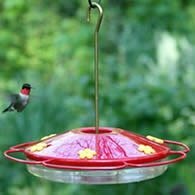 One day while sitting on our back deck we heard little tweets coming from the lid of our gas tank that sits near our master bedroom window. Closer observation revealed twigs sticking out from under the lid. I carefully opened the lid and a small bird flew out. Closer observation revealed that this was in fact a bird's nest. I carefully closed the lid so as to not disturb the nest any further. 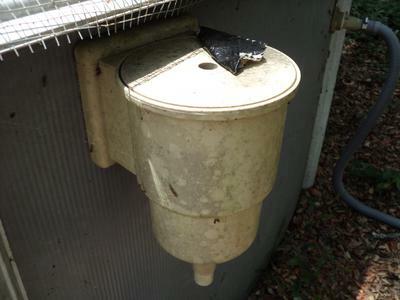 Then I worried that my tampering with the lid might have scared the bird away for good. 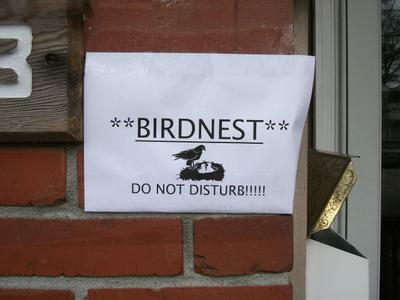 I told my wife about the nest and the small bird that flew away. Because many types of birds visit our yard, including blue birds, doves, blue Jays and others, we couldn't be sure what kind of bird it was based on my quick encounter. We decided to be pay attention over time to see if the bird returned and then figure out what it was. We watched and waited for several days and sure enough one day we spotted the small bird returning to the nest. I obviously did not scare it away for good. My wife thought she recognized what type of bird it was and said it looked like a Wren. 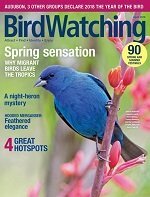 She thumbed through the pages of bird watcher's book we often refer to and sure enough she located the drawing of a familiar bird, it was a Wren. We first noticed the nest about two weeks ago. Now the tweets have become louder. This morning I carefully lifted the lid again and photographed the baby Wrens in their nest. We are proud grandparents of at least 3 healthy baby Wrens. There may be another in the back of the nest but I am not sure. Attached is a photo collage of our new extended family. Thanks for sharing your wonderful little story. Wren's are enterprising little guys and they really do nest in the oddest places. The picture is so cute! Good Luck to you a your new grandkids. I had a small basket hanging on my front door filled with flowers. 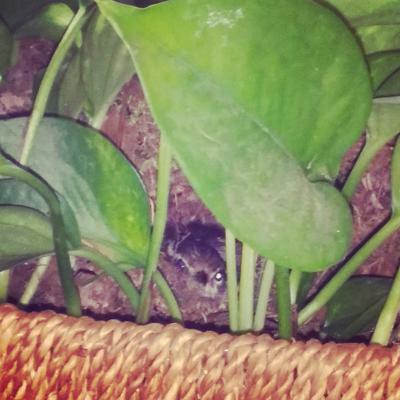 I started noticing a small bird flying in and out of the basket and after a week or so I decided to look inside the basket to see what was going on. Much to my delight, I discovered a little nest with 4 eggs! I thought, "Won't this be fun to watch the baby birds!!" Well, a few days later, I was walking out the front door and thought I felt a little "swish", but I didn't see anything so I continued on my way. About 20 minutes later, my 15 year old son came downstairs and said that his 17 year old brother needed me to come to his room because there was a bird!! I ran upstairs and lying on the floor on his back was a tiny wren. I noticed it was still breathing so I gently picked it up while my son explained that our cat had been running around with the bird in his mouth. So, I took the helpless creature outside and I sat in the rocking chair holding it, and examining it, noticing that the tail feathers were gone as well as the right wing feathers. The good news was that there was no blood and birdie was definitely starting to perk up! We happened to have a 10 gallon tank, so we put it in there along with the basket/nest/eggs and some sticks, grass, leaves, etc. Just look at the bottom inside of this Wrens tail feathers! 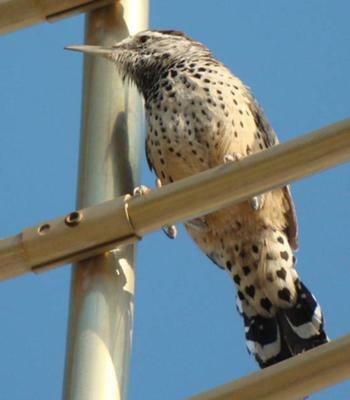 The Cactus Wren can be one of the most annoying birds, to have around your house. They are destructive, mischievous, and LOUD. But then they are one of my favorites! I always know when something is in and around my house, that shouldn't be.. by the way they squawk.. at trouble. They are, my little watch birdies. They always seem to get into trouble. I've had to let one out of my wood burning stove, just opened my living room door.. and then opened the door to the stove.. and out it flew. I heard something flopping around and then saw it in the stove hitting up against the window. Poor little thing. I didn't even know how long it'd been in there! What if I'd had a fire going in there?? Yikes! Another time, I heard something scrambling in a bag of trash I'd set near my back door, before taking it out. I was afraid to take a close look.. I did, and there was a Wren. It'd gone in the bag after something, through the tiny little loops at the opening, and was panicking because it didn't know which way was out. I just ripped the bag open and off it flew. They've given me some great pictures.. one of which was this one. When I took a close look at the markings on the inside of its tail feathers, I just about choked!! How awesome!! Hearts!! I since have many pictures like this, that show their hearts.. such a neat find. I noticed little items being placed on our porch below a wrens nest, a weathered piece of glass the size if a nickel, a rusty screw, roofing nail, rusty old nail. These were left one at a time. I looked at the wrens nest and there was a drywall screw sticking out. Do the males bring gifts to the females? Anyone? 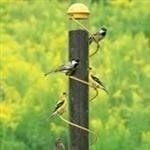 I am not a bird watcher as such but this has me baffled? 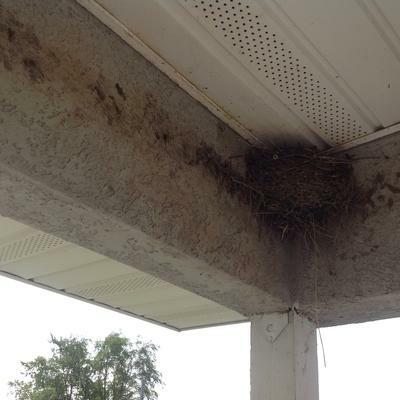 I came back later and the drywall screw was no longer in the nest but was laying on the porch. I moved it over next to the other items. Later I went back and noticed the drywall screw was gone. It makes me think that the male is bringing her items and she has rejected them. I continue to watch and photograph the progress of this baffling mystery. Hi! I am glad I found this site! 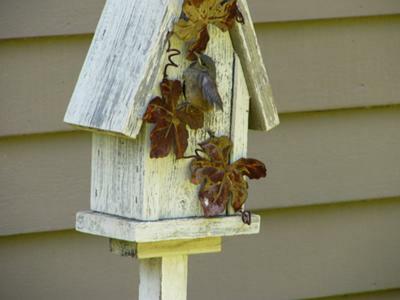 Every year I noticed these little brown birds… I always called them nosey birds because they alway came to the porch while we were sitting there checking us out...anyhow I would notice one would always build a nest in my hanging vine plan.… .same one… but they never stayed. This year I saw the same thing this little brown bird building another nest in same plant. Just last week. So I checked it out and was really impressed by this awesome little cave nest. Seemed like it was going to remain empty again so I thought nothing of it. 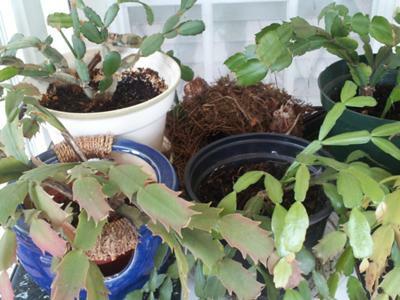 Then I go to water said plant and I hear a little "cheep" so I thought there were babies. I out water can away and come back to look at nest and was empty. So I was baffled I didnt really look deep enough. So yesterday I look and as I tilted plant forward I noticed about 4 little tiny eggs! So I must have watered poor mommy as she was laying an egg. I hadn't seen mama in a while so I was worried she had abandoned the eggs. 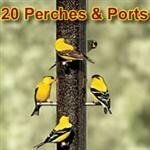 So I get one and Google little brown nosey birds in Ohio and found a picture which led me to this site and was amazed at the stories. So I look last night and there she was looking back at me. I took a picture this morning and there she still sat a patient mama. I half-filled a Rubbermaid 10 Gallon wastebasket with soapy water from the hose, and left it out in the yard to dissolve the residue at the bottom. I returned after a couple of hours to find an unfortunate dead bird floating at the surface of the water. I presume he went in for a drink, and couldn't fly out of the steep-sided walls and short liquid runway. The detergent would have wet his feathers more quickly, defeating any protection that possible oiliness might have provided. He was afloat, when found, but apparently couldn't stay oriented in a position to breath. I think he was a House Wren. See the photos. There is a wren nest built in an old swimming pool where the water goes out of the pool and into the filter. There are 2 (as far as I can see) babies already hatched and then all of a sudden right at the mouth of the nest another egg appeared with the babies still in the nest. Today I went to check on them and there is another egg right next to the other one. Is this normal? Comments for 2 birds 1 nest? It's more likely these eggs did not hatch and were moved to the edge of the nest. When eggs don't hatch, the adults moves them away from the hatchlings. I recently found an old hand water pump in my husband's shop. He decided to clean it up and paint it. We then mounted it to the corner of the deck hand rail. 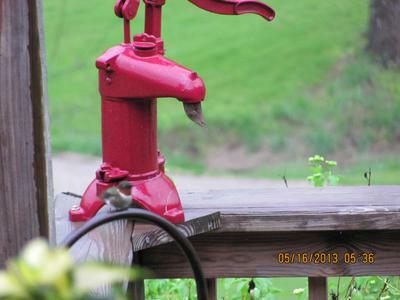 It only took a few weeks, when I noticed there was a pair of wrens going in and out of the pump spout. As I continued watching, they started bringing small sticks. It became quite comical if the stick was turned perpendicular to spout and wouldn't go into spout. Eventually, they would drop it enough times that it would be in the correct position for entry. Whenever I needed to water flowers on or near the pump, I would get scolded for being too close. Once, the little female was right at eye level with her warnings! In a few weeks, we could hear the chirping of the fledglings. We watched as female would fly in with food, then wait for male to arrive. You could see her little beak outside the spout as she took the meal from the male. He would occasionally go into spout, but the majority of times, it was the female. I only saw one of the babies take its first flight, but didn't have a camera. The photo I have included is the female entering the spout. Wrens Return to Nest in Tree By Front Door. It is so much fun to watch the wrens return again This year to nest in the same spot. I’m not sure if it’s the same wren or different moms every year. You could see she was upset. Luckily the eggs and nest didn’t fall out. I hope momma bird will get back on her nest. Our grandchildren are big Star Wars Fans. 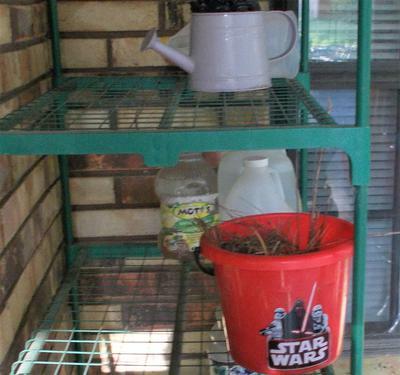 I bought some buckets with Star Wars pictures for them to play with at our house. I started using them to put weeds from the flower beds. I kept emptying the sticks and weeds but they kept reappearing! One day I looked in and saw several small eggs in with the sticks and weeds. 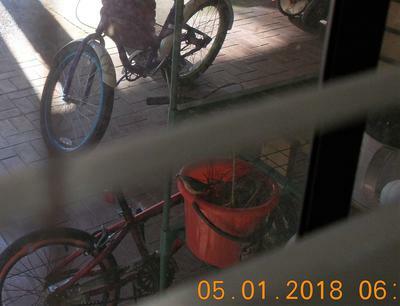 Since this bucket is stored next to the window, I was able to get a picture from inside through the blinds. I can also watch the male Wren bringing insects in to the female. I am hoping, since it is time for the eggs to hatch now, and it is the first week of May that they will be coming out on May the fourth and we will have a bucket of "Kylo Wrens." May the Fourth...(Force) be with you!